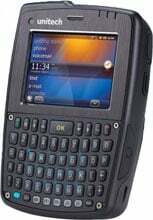 Unitech PA550 - 35G GPRS, Free 6 Months 500K Data Plan (US Only), 1D Laser Scanner, Windows Mobile 65 Pro, 806 MHz, QWERTY Keypad, 256 MB RAM, 512 MB Rom, Micro SDHC, 28" QVGA Sunlight Readable Touch Screen, 50 megapixel Camera & Flash, Rechargeable Lithium-ion Battery 2500 mAh, AC Power supply, USB Communication & Charging Cable, IP54, 4' Drops to Concrete. Interface Cables And Charging Cradle Sold Separately. The Unitech PA550 combines rugged industrial construction with smart phone functionality, making it ideally suited for sales automation and field service applications. Featuring a durable enclosure able to withstand 4-foot drops to concrete and shield against water and dust, the PA550 is designed to perform under harsh conditions. Despite its compact size, the PA550 is an extremely powerful mobile device. Driven by a high-speed 806 MHz Marvell processor and Windows Mobile 6.5 operating system, the PA550 boasts full wireless connectivity, QWERTY keypad with programmable hot keys, and exceptional battery life for extended device runtime. The PA550 features an auto-focus 5.0 megapixel camera allowing users to take photos and video for proof of service applications. With its integrated GPS, Bluetooth, Wi-Fi and 3.5G WAN wireless connectivity, the PA550 provides positioning, tracking and tracing capabilities - anytime, anywhere. The Unitech PA550-9892QADGDP is also known as UNI-PA550-9892QADGDP	or PA5509892QADGDP	.